Durability, style and practicality. Triple-stitched seams, chap-style double layer knees, "mudflap" reinforced heel cuffs, reinforced pocket bags, angled back pocket, and quick-draw cell phone pocket with snap closure on right thigh. Durable canvas fabric and not too stiff. Super comfortable. Great freedom of movement because of the crotch gusset and the way the knees are sewn. I love these pants. I normally wear a 36x32 in most pants and jeans. In these, I had to buy 38x32, which fit me the same as a 36x32 in other pants. Just a tip for anyone wondering about the sizing. Where do I start.....the comfort, durability, and construction a second to none. Beyond comfortable and the fit is perfect for an average size guy. I also have several pair of the Camber 105's but I will have to say that the 107's are my new favorite. Ordering two more pair this week. 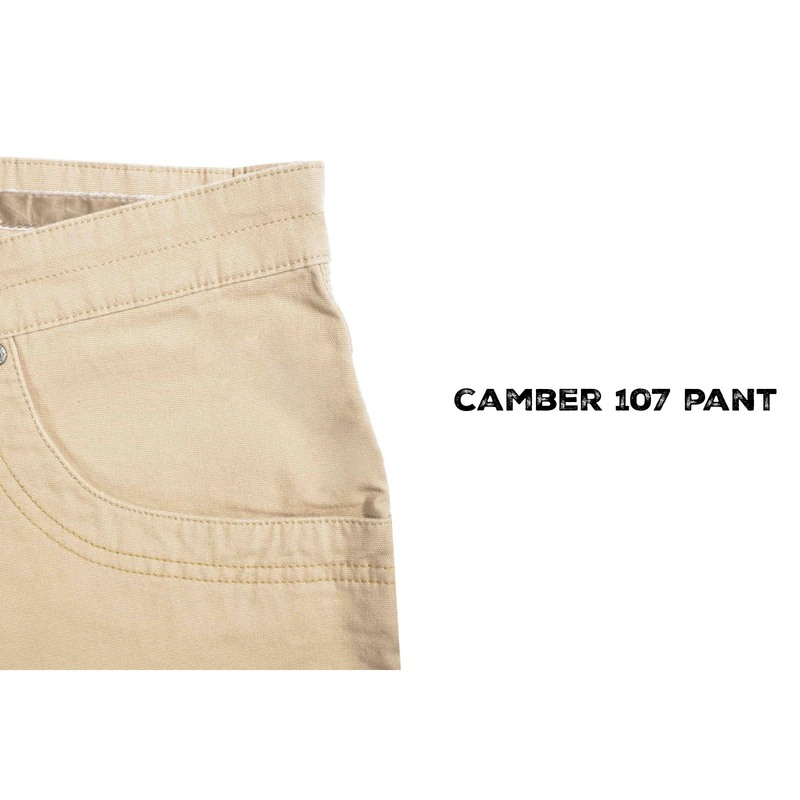 I have seven pairs of Mountain Khakis pants mostly Camber 107. I wear them daily because I feel great in them. I love the style, colors and the utility of them all. I have nothing bad to say about Mountain Khakis. I have 10 pairs of these pants from 3 years old to recent day (some of the others didn't make it through the grease and crotch tears). These are my go to pant when workings construction or hitting the trails with the kids. The reinforced knee is on point and the pockets are sturdy enough for drywall screws or apple slices. I definitely recommend these pants to all my friends and anyone willing to listen. MK: If you get to reading the reviews here's what needs to change: Add some elastic or flexibility to the crotch, it tends to tear or limit you when making large vertical steps. Give an option for a more athletic cut, the bagginess of the pants from 2018 are just a little like the original MK pants and don't fit well in meetings or on a bike (the year before seemed to be tighter in the legs around the knee and boot. Give us a reinforced leather tab on the right pocket for our knives instead of the leather tag on the rear that's covered by the belt. I bought two pairs of these pants about 18 months ago and they are awesome. the pockets are the perfect size, the material is super strong, and I get tons of compliments about them (some from my wife) which is all good! Fast forward to a couple of weeks ago and I ordered a couple of more of the same thinking they would be just as awesome. I was not as satisfied. It appears the material has been changed and is much thinner and the sizing is way different as stated by Beach's review below. The new ones I received are significantly longer than the same sized ones I ordered 18 months ago. The waist is about the same. I was hoping once I found my size it would be good for life but I guess the search continues. For the first order of these pants 5 stars. for the second order 2 stars for sizing and material change. split the difference at 3 I guess.